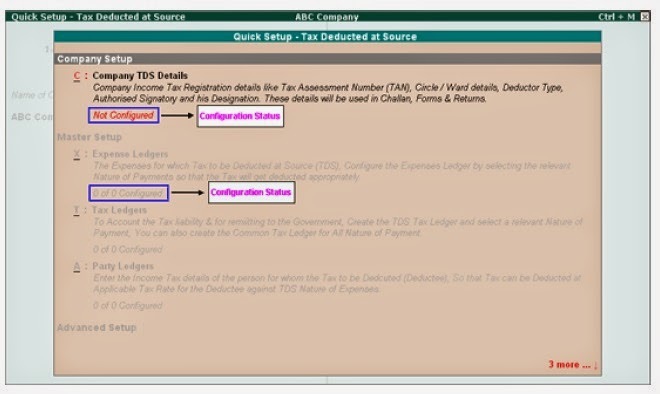 Quick Setup for Tax Deducted at Source in Tally.ERP 9 helps you to configure statutory setup required to maintain the financial records of TDS. 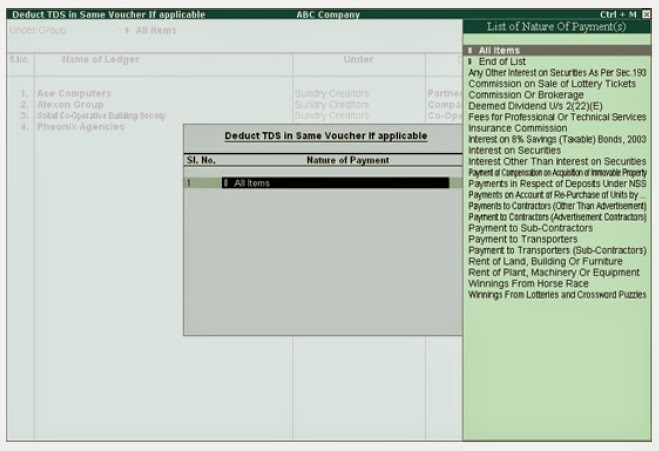 From this screen you can make required basic configurations like, company TDS details and masters to account statutory transactions. It also allows making advance configurations wherever applicable. Configuration details will be displayed below the setup options once the configuration is done. Otherwise application will display the status as Not Configured for Company Setup and 0 of 0 Configured for other setups (Masters/Advanced setup). Company Setup guides you to update relevant TDS details . To know how to update TDS details Click on the link, C:Company TDS Details Setup screen. Note: To move from one setup to another setup use Arrow (up and down) Keys. Master Setup guides you to create masters like Expenses ledgers, Party ledgers and Tax ledgers by enabling relevant TDS options in the masters. For more details on master creation Click on the below links. Advance Setup is an optional (not a must) setup. Advance set up is required, only when you want configure for Lower/Zero deduction, to calculate surcharge or income tax by ignoring the exemption limit and to deduct TDS in the same voucher if applicable. Advanced Setup guides you to configure for lower/zero Deduction, calculate surcharge or income tax by ignoring the exemption limit and to deduct TDS in the same voucher if applicable. For more details on advance setup Click on the below links. click on F5: Show Adv config button in the buttons bar. Assessing Officer shall issue a certificate for deduction of Tax at Lower rate than the relevant rate specified under the section, Where the assessing officer is satisfied that the total income of the recipient (Assessee) justifies the deduction of income tax at any lower rates than the rate specified under the sections specified under the act and has received an application in Form 13 from the assessee under sub-section (1) of section 197. 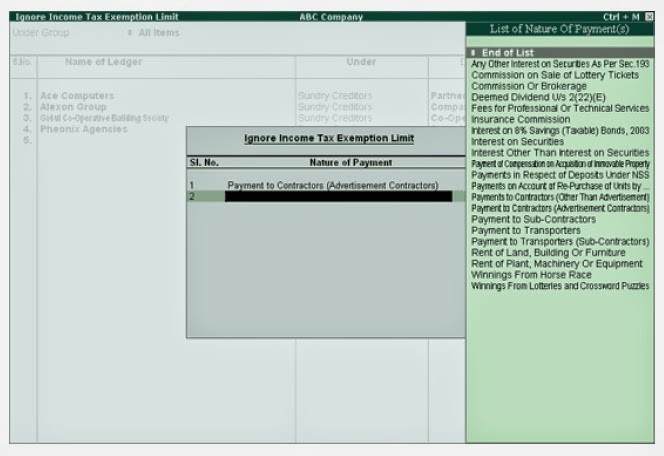 In Tally.ERP 9, the user can record and compute TDS on transactions, on which lower rate of deduction is applicable. To configure party ledger for Lower rate of Deduction press Alt+L or select L: Configure Lower Rate Deduction (Sec 197) and press Enter to view Lower Rate Deduction (Sec 197) Setup sub-form. Example: ACE Computers has a certificate for deduction of Income tax at Lower rate @ 5%, on Commission or Brokerage. Enter the name of the Party Ledger in Name of Ledger field e.g. Ace Computers. 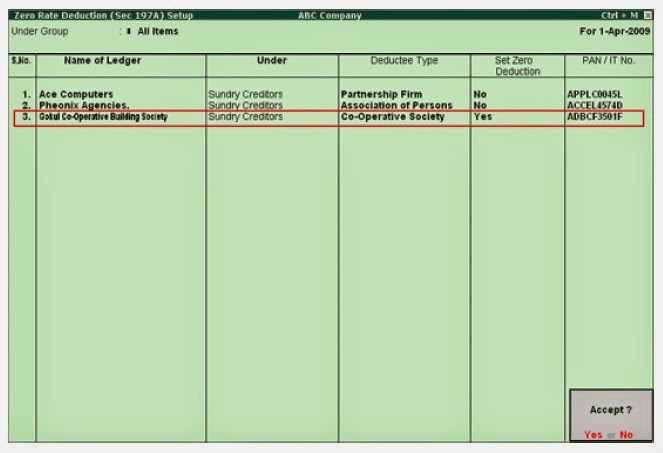 Select Sundry Creditors from the List of Groups in the Under field. In Nature of Payment field select the nature of payment - Commission or Brokerage for which lower deduction is allowed. Certificate No./ Date: Enter certificate number under which the lower rate of TDS was allowed and the date of issue. Applicable From: Mention the date (as per the certificate) from when the lower rate is approved. Applicable To: Mention the date till when the certificate of Lower rate will remain in force. Surcharge, Ed Cess and Sec Ed Cess: In these field Tally.ERP 9 defaults the percentage to Zero. A Deductee (other than Company or Firm) can submit a declaration in Form 15G under sub section (1) of section 197A, for TDS deduction at Zero Rate. Declarations can be given only by those deductees whose income is below the taxable limit and the income falls under section 193, 194, 194A, 194EE and 194K. The certificate granted shall be valid for the assessment year specified and is valid only for the person named therein. Example: Gokul Co-operative Building Society has a certificate for non-deduction (zero rate) of Income tax on Rent. Enter the name of the Party Ledger in Name of Ledger field e.g. Gokul Co-operative Building Society. In Nature of Payment field select the nature of payment - Rent of Land, Building Or Furniture for which zero deduction is allowed. Section Number: Tally.ERP 9 displays the Sections, under which an application for lower rate (section 197) or Zero rate (197A) are approved. Select section 197A for zero deduction. Press Enter to save Zero Deduction Setup screen. In PAN/IT No. field enter party PAN Number. To know more on configuring party ledger for zero rate refer the topics - Creating Party Ledger- Zero Rate. As per Income Tax Act, Surcharge on TDS is applicable for the payment(s) exceeding Rs.10 lakhs (for Individual, HUF and Association of Persons) and Rs 1 Crore (for Companies, Artificial Judicial Person and Partnership Firm). However it is not applicable for Deductee Types such as Co-Operative Society and Local Authority. In TDS, when the payment exceeds the Surcharge exemption Limit, Surcharge is applicable on the entire amount right from the first transaction and such past transactions will have to be shown in the e-TDS statements. In this scenario it is always suggested that a realistic estimation of total amount, to be made right in the beginning and deductor should deduct TDS without considering the Surcharge Exemption Limit. To configure party ledger to ignore surcharge exemptions press Alt+S or select S: Ignore Surcharge Exemption and press Enter to view Surcharge Exemption Setup screen. Enter the name of the Party Ledger in Name of Ledger field e.g. Alexon Group. Set the field Ignore Surcharge Exemption to Yes. Skip PAN /IT No. field. Tally > Accounts Info. > Ledgers > Create/Alter. As per Income tax TDS is Deductable only when the TDS amount exceeds the specified Income Tax Exemption Limit. amount, to be made right in the beginning and deductor should deduct TDS without considering the income tax exemption limit. Example: For Pheonix Agencies realistic estimation has been made. The total payments exceeds the TDS exemption limit and hence want to configure the party ledger to deduct TDS from first transaction. Most of the company's Deduct TDS in the same voucher where the due/payment is booked. In Tally.ERP 9 you can configure the party ledger to deduct TDS in the same voucher where the due/payment is booked without asking for confirmation. Example: ABC Company follows the procedure of deducting TDS for all parties when the due/payment entry is recorded. 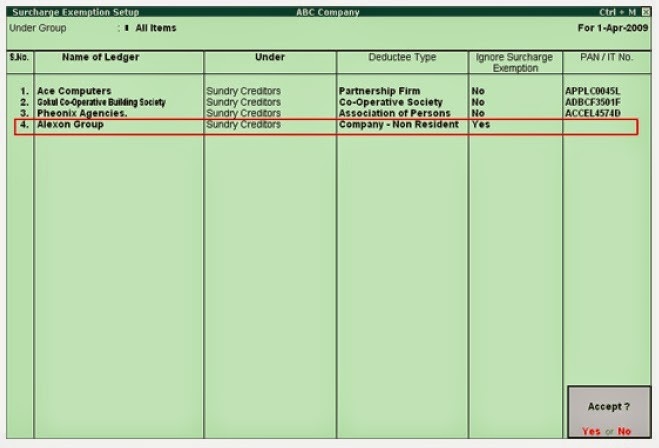 Select ACE Computers and tab down to Set Auto Deduction in same voucher field and set the option to Yes and press enter to view Deduct TDS in Same Voucher If Applicable screen. Any specific Nature of Payment (s) e.g. Payment to Contractors (Advertisement Contractors) to deduct TDS only for the selected nature of payment (s). Press enter to save Deduct TDS in Same Voucher If Applicable screen. Similarly you can configure all the party ledgers to deduct TDS in the same vouchers if required. 3. Press Enter to save Auto Deduction Setup screen. Note: You can also configure party ledger to deduct TDS in the same voucher if applicable from Gateway of Tally > Accounts Info. > Ledgers > Create/Alter. To quit from Quick Setup- Tax Deducted at Source screen press Alt+Q or select Q: Quit and press enter.